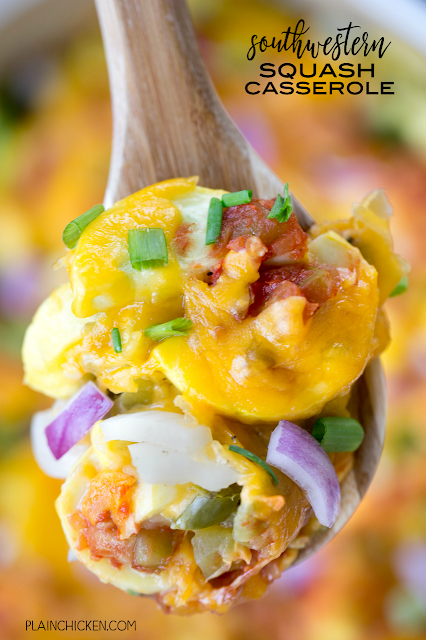 Southwestern Squash Casserole - CRAZY good!!! Great side dish for all your tex-mex dishes!! Squash, cheddar cheese, onion, green chiles, jalapeños, cumin, salsa, green onions, red onion. Everyone loved this easy side dish recipe. Great for a potluck and cookout. 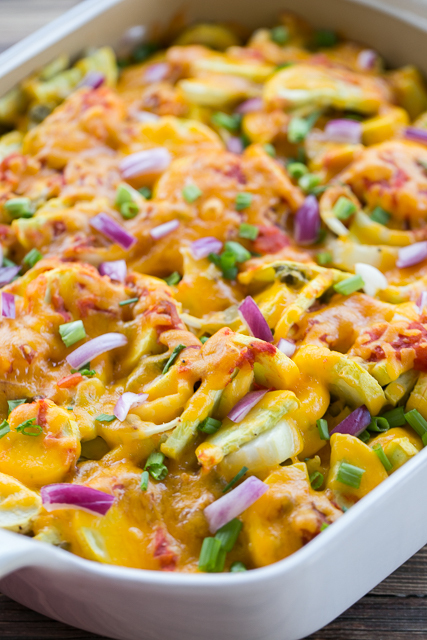 This Southwestern Squash Casserole is a new favorite in our house. Squash, onions, peppers, salsa and cheese. All of our favorite flavors in one dish. YUM! We ate this a couple of days in a row and it was delicious every single time. This recipe makes a ton. It is great for a summer cookout. You can make this ahead of time and refrigerate until you are ready to bake the casserole. This goes great with the Taco Ranch Chicken I shared earlier this week. It is also great with steak and pork. We've made it several times over the last couple of months and it is always a hit! In a large bowl, combine squash, 1 cup cheese, onion, green chiles and jalapeños. Sprinkle with flour, cumin and salt. Toss to combine. Transfer squash mixture to prepared pan. Bake, covered, for 30 to 40 minutes. Remove from oven and top with salsa and remaining 1-1/2 cups cheese. Bake uncovered for an additional 10 to 15 minutes. Top with green and red onions before serving. Do you think I could prepare all of the ingredients in a tin and freeze to bake later?